Queen B Team Captain Brid interviewed Sharon in Cork Harlequins Hockey Club. Best. Day. Ever. When and how did sport capture your imagination? I always remember sport in my life, my Dad was very sporty and had a general interest in all sport so he brought us to everything, swimming, tennis, athletics, hockey and watching Match of the Day highlights and horse racing also featured. I do remember our primary school sports days and never winning but always wanting to and always envious of Jane O’Hagan, Virginia Manning and Martina Clancy who were the fast ones. At what point did you decide to plough forward and pursue hockey at an elite level? I started hockey when I was 11 in Catholic Institute, Limerick, played outfield and enjoyed it. When I was 14 my Dad (who worked in the bank) had to move to Cork, so lock, stock and barrel we left Limerick and arrived in Cork in the Summer of 1984. I started in third year in Regina Mundi College, which was a hockey school and only down the road from us. I remember going to the first training session and Ms. Cook our coach and teacher, asking would anyone like to try goal. My Dad had played in goal, so it wasn’t totally alien to me and I thought to myself, “Ah sure I will give it a go” and that moment was probably a huge moment in my sporting life. I put on the pads and was able to stop the ball, got on the Junior A team and as they say the rest is history! Clearly you are a bit of a genius because we read you only ever visited the Boole Library in University College Cork to find a date to the Hockey Club Ball (You legend) What did the link between sport and university mean to you? Sport is always a great diversion to studies, while we all have to study to pass that exam or get that degree, having a sport or an interest also relaxes the brain and even makes it work better. For me college life had a great balance between study and sport. In UCC with sports bursaries (now scholarships) we had financial and professional help when it came to our sport, which made life that bit easier. 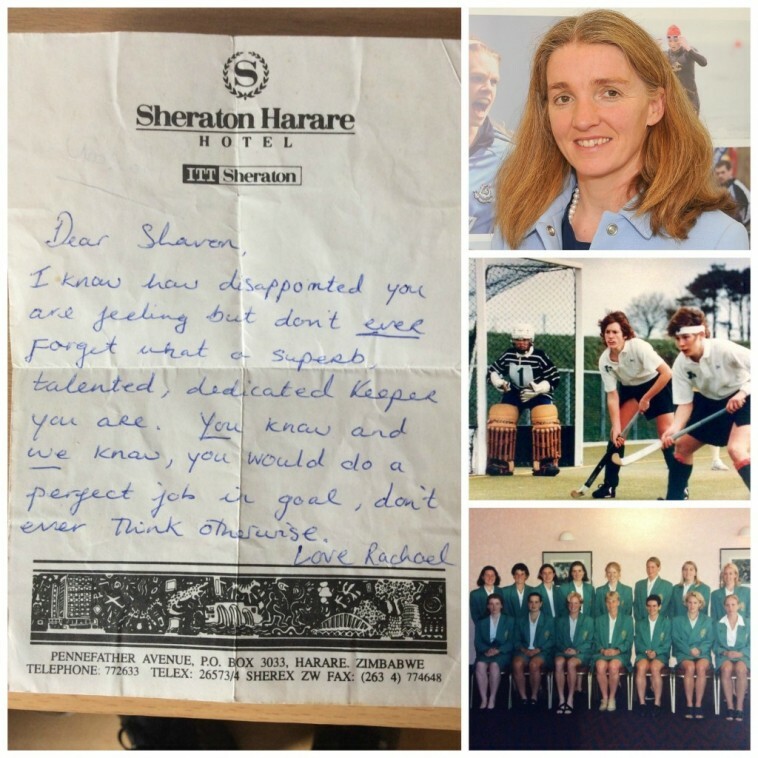 Also playing with a group of girls the same age was great craic and as I did spend 8 years there it definitely complimented my international sporting life. You were one of the first people to receive a UCC Sports Bursary. What did this mean to you? It was a huge support at the time. It gave us financial assistance which helped to curb the travel costs mainly. Luckily as an international our gear was sponsored, we would usually stay with other players or management over training weekends so we did try to keep costs to a minimum. Access to gym facilities were available to us on campus. If you were playing in a non college setup, all that support would not have been there. As we mentioned in our intro. We want everyone to feel like they can start a new sport at any point in their lives. Our opinion on this is, just ask. What do you think about easy entry into club sports? I do think as human beings our worst enemy is ourselves, we can stop ourselves from doing so many things. I agree with just ask but we have to appreciate that there are all types of people out there who won’t just ask. I would say a club needs to be friendly, not cliquey, it needs to welcome and cater for all skill levels and not just the elite/senior. International career highlight? Club career highlight? My international career highlight was my first cap in 1992 in my home club Harlequin Park in a Home Countries against Scotland (unfortunately we lost, but I remember feeling very proud on that day). I should also mention competing in the World Student Games in 1991 in Sheffield, the closest I got to playing in an event like the Olympics. My club career highlight can only be winning the Irish Senior Cup in 2000, my last game for the club, we beat Hermes 2-1, scoring our winning goal in the last 30 seconds, and keeping that ball out of the net on several occasions ! We have spoken in the past about supporting women in sport by just getting out and attending women’s sports events. Tell us your thoughts on this? I do think it is important we support our female athletes more. We need to go to their games, bigger crowds, means sponsorship for the sport and in turn if money is there to invest in the sport, the sport can only get better. I do think more media coverage would put women’s sport more into the psyche of the general public and we might think about going to that match if we hear about it on the radio or read about it online or in the newspaper. At the moment there is very sparse national media coverage so if you don’t hear about that game or know about it, you won’t go!